Performing monthly breast examinations are highly recommended. Encourage your loved ones to have yearly mammograms. If in doubt, seek out medical attention! I learned from my sister who had Breast cancer at age 31. Don’t wait! Can I perform exercise or physical activity after Breast Cancer? The answer is a resounding “Yes”. Cancer risk factors decrease with each acute bout of exercise. The accumulation of 150 minutes of moderate exercise and/or physical activity each week is recommended. Structured exercise can also prevent other diseases such as diabetes, heart and respiratory diseases. Physical activity also helps with improved mood and well-being. In short, any and all activity counts for your lifelong health and wellness. What kinds of exercise can I safely perform during medical therapy sessions? For people who have canc er and are in the midst of chemotherapy or radiation therapy, exercise can prevent tissues and muscles from becoming stiff and weak after a lumpectomy or radical mastectomy movement is essential. Gradually increase your activity. Listen to your body. Breathe. What’s important is to maintain your strength, endurance and flexibility plus quality of life. Strength: Strength training can keep your muscles in good shape to do your daily work, chores, and feeling good about your body. Endurance: Aerobic activities, such as walking or cycling, can help keep your other joints moving freely so you have more energy for your favorite hobbies or for playing with your children or grandchildren. Flexibility: Yoga can help with flexibility, balance, and strength so that you can put on your bra, tie your shoes and go to the grocery store or shopping. Yoga can also help with pain and stress management to get through your days and nights with better sleep hygiene. What about lymphedema after surgery? If you have had breast cancer and surgery, some complications that may occur include lymphedema, loss of arm mobility, strength and function, depending on the extent of your surgery and stage. Early detection is important at stage 0, 1, 2 and before local spread stage 3, or metastases at stage 4. Gentle active movement or physical activity helps reduce lymphedema (swelling of the involved arm), reduces stiffening of tissues including muscle and facia from the underlying bones and joints. You may need to seek and expert in lymphedema management. Short bouts of exercise and a walking program integrated into your daily routine (at times when you are less fatigued) can improve conditioning. In combination, nutrition, sleep hygiene and physical activity form the triad of recovery from breast cancer. How can I minimize Pain? Movement can reduce pain when performed in therapeutic amounts. Soft tissue mobility and strengthening in combination with gentle stretches may be helpful to reduce your pain. Are individual or group sessions best for me? 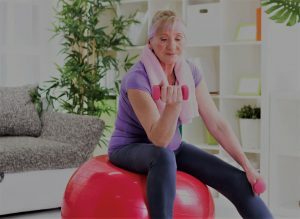 After a diagnosis of breast cancer, exercise sessions under the supervision of an expert physical therapist is vital for your successful return to full functioning and quality of life. Having someone to support you can be fun! Quality of life is the ultimate goal as you return to typical activities to get your life back after breast cancer. After my sister went through breast cancer at age 31, she came back with so much energy and passion for life. She is an inspiration to me and so many others. Contact Dr. Ann H. Newstead, PT, DPT, PhD for more information or a complementary 30-minute Discovery Consultation Visit. A Healthy Life for All Ages! Consider NEAT as a boost to your metabolism ~ What is NEAT? Consider standing at your workspace eager than sitting. Organize your workspace so you can raise the height of your desk so to accommodate your computer and other materials. As you know, the Holidays are fast approaching, and with so much emphasis on shopping and eating, it’s easy to end up sacrificing your fitness routine. Plus, the Holidays can add a significant level of stress, causing your heart to work overtime and affecting your health. But don’t worry, there’s good news! Are you ready to get a head start on your Yoga fitness before the Holidays arrive? Finding the right Yoga class will be the key to keeping you motivated and helping you reach your desired goals. Whether you attend group classes or practice at home, you will see a marked difference in how you feel from day to day. • Breath Control (Reduce Stress) – In Yoga practice, you will learn about conscious breathing, which activates the cerebral cortex and limbic centers in the brain, which then effects your emotions. Focusing on conscious breathing with each movement helps to reduce stress on both your body and mind. 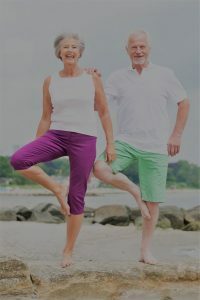 • Improved Balance – Balance is vitally important in reducing the risk of a fall, and will help with improved reaction time in preventing a fall. Balance is needed in just about everything you do, from walking, to navigating stairs, to tying your shoes. There are many Yoga poses that help with posture and to improve balance, to help you stay steady in all your daily activities in your home and community. • Increased Flexibility – Stretching is an integral part of flexibility. Yoga poses focus on gentle muscle stretching, flexibility, strength, and balance; some forms of Yoga also improve cardiovascular health. 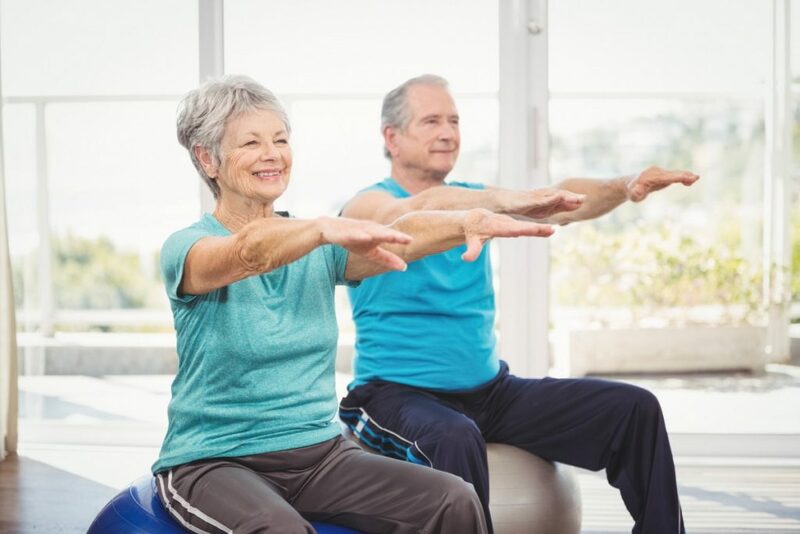 Staying active and maintaining muscle flexibility can reduce chronic back pain, and may increase independence for you to stay active throughout your aging process. Starting early in life to maintain flexibility, along with strength and balance, are vital for healthy aging. Less stress, steady balance, and increased flexibility are all great reasons to practice Yoga! Yoga is an enjoyable way to manage the toll of Holiday stress on both body and mind. So, this year get an early start on your fitness goals and help prepare your body for the busy days to come. Wishing you happy, stress-free, Yoga Holidays! Looking for a Yoga class? AHNew Physical Therapy offers Yoga classes on Tuesdays, from 6:30 to 7:30 with Geanetta. September is Fall Prevention Month! Are you living with dizziness or disequilibrium? Do you have difficulty changing positions? Have you had a previous fall? What contributes to your vertigo? Changes in aging systems. Your visual, sensory and vestibular systems in combination with your muscles are important for staying upright in your world. All of these systems work together to minimize your dizziness or imbalance (e.g. disequilibrium). Working on your neck motion and eye coordination and scanning can improve your vision especially for driving! Standing with eyes open feet together holding a countertop can challenge your balance! Changing positions may create dizziness or light headedness or vertigo. Or when you move from sitting to standing you may feel light headed, you may have a drop in Blood Pressure. Or vertigo when your world moves around you and you feel off balance. Changes in strength that effect your balance and walking. Have you been told that you cannot improve your balance or decrease your dizziness? Have you had difficulty with dizziness or balance for a few weeks, months, years? Has your walking speed decreased? You do not need to live with reduced physical functioning. You can improve your strength, flexibility, endurance, and ultimately your eye-head coordination, dizziness and balance. Research strongly suggests that people in their 40’s begin to lose strength; even people in their 90’s can improve strength. Begin an strengthening and flexibility program gradually increasing under the supervision of your physical therapist. Too many Medications or Polypharmacy. Do you take more than ten (10) medications? Many medications interact and the effects are cumulative that can lead to dizziness, vertigo, imbalance or disequilibrium. Medications can also contribute to fatigue or weakness. If any of these are true, you need your medications reevaluated by your PT. Mood changes. Has your quality of life decreased because of your dizziness? Are you basically satisfied with your life? Is your mood out of sorts because you feel you cannot go out and be with friends or family? Call a friend or family member to say hello or volunteer to help someone or a cause. Fear of falling. Are you fearful of falling? Fear of falling may be a common frustration. Fear of falling is most common after one or more falls. Use of a device such as a cane or walker may provide you with some more confidence. If you don’t like the idea of a cane, dress it up! Show your personality! Home hazards. Is your home a fall hazard? Do you have lights in each room? Do you have handrails to hold in the bath? Keeping your home safe and free from hazards is important to avoid falls. If you have dizziness and difficulty scanning your environment, you have need to declutter. If you have disequilibrium, keeping areas in hallways and in your kitchen, bedroom, bathroom and living areas free of throw rugs to avoid trips and slips, may help you to avoid injury. Chronic falls – Two or more falls in the last year. Do you have medical problems that contribute to your dizziness or falls? (Cancer, diabetes, stroke, Parkinson’s?) If you have had two or more fall over the past year, you have a chronic fall problem. A fall is defined as “any change in body position resulting in contact with the ground or with another lower level” (REF) If you have low blood pressure, you may suddenly feel light-headed. Lightheadedness differs from dizziness in that you may ability to turn your head without vertigo. Would you like to learn more about physical activity and exercises to improve your strength, balance and walking? There are exercises and physical activities that can improve your ability to decrease dizziness and disequilibrium. Ask your physical therapist for a one-on-one evaluation, education and an individualized program just for YOU! Improve your quality of life! 1. Eye-head coordination: turning your head side to side, in sitting focus on a target. Can be done in standing holding a firm surface. 5. Walking: 30 minutes daily – use a heel toe smooth pattern and take longer steps. Use walking poles for improved confidence. Every exercise bout, physical activity and walk counts – park a little further away from your destination! All activities are cumulative throughout your day. If you would like to learn more, contact us for a Free Report and/or a Free One-On-One Discovery Consultation Visit to learn more, contact us today. Reference: PREVENTING FALLS: A Guide to Implementing Effective Community-Based Fall Prevention Programs. CDC – Centers for Disease Control and Prevention. National Center for Injury Prevention and Control. 2nd Edition. 2015.